The new DOCUCENTER EXPERT is a completely new designed equipment with all kinds of integrated illumination systems, new designed optics, operation via touch-screen/jogger knob as well as PC system and PIA-4000 software. Different languages are selectable, easy to operate and short user instruction time. It has specially integrated features such as IR 980 diode for examination of anti-stoke inks and LED ring light illumination for OVD inspection. System provides outstanding field of view of 185x138 mm. 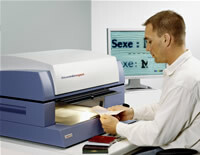 The ideal working tool for investigation of security documents, identity cards, banknotes, etc. for quality control and security features. All working steps and findings can be documented and filed individually as required. The portable and compact workstation for laboratory and field application. Completely new designed system with all kinds of integrated illumination systems, new designed optics, operation via touch-screen and jogger knob, storage of up to 200 instrument settings via internal memory and via USB memory stick, different languages selectable. The system for uncompromising document investigation and efficient working methods for mobile use. The user-friendly system for passport/document reading. The device enables to capture and transfer full-page video images of identification card, passport-card, visa, passport and other documents to PC or Laptop. An ideal tool for mobile use at the front, such as immigration check points, airports, banks, police departments, embassies and many more. It disposes of white light, IR light, UV light and Coaxial light (3M). RFID verification available on request.